Our email archiving software has been rigorously audited and is now certified as being compliant with data subject rights under the EU’s General Data Protection Regulation (GDPR). But what exactly does that mean? “[..] On the basis of the findings made during the audit, the MailStore Server software, when used correctly, meets the requirements of the applicable German laws, including the requirements set out in the General Data Protection Regulation (GDPR).” This is what is stated in the audit report compiled by German independent data protection experts. In a multi-level process, the experts analyzed our software in terms of its ability to comply with the principles of data privacy, as set down explicitly in the EU GDPR. Both the Bundesdatenschutzgesetz (BDSG – German Federal Data Protection Act) and the 2018 version of this Act (BDSG 2018) were incorporated in the analysis. The audit procedure followed the approach set out in Directive IDW PS 330 on the auditing of IT-based systems. In addition to a comprehensive application test, documents were inspected and procedural documentation and a pre-specified test database for emails used. Archived emails contain personal data. With MailStore Server, the contents of an email can be fully searched, extracted in a commonly used format, and then made available. This enables companies and organizations to meet their obligation to provide information. When a company processes personal data, it must demonstrate that it has obtained the consent of the data subject to do so. The data subject must also be able to withdraw this consent. As MailStore Server is an email archiving software, the consent and withdrawal of this consent, as issued in emails, are captured in an upstream system. The resulting transaction emails – for example opt-ins of email marketing or lead management systems – are reproduced in the email archive. With the aid of individually configurable retention policies, the software allows you to automate the deletion of emails from the archive, i.e. including personal data stored on the data subject. Furthermore, delete requests can be recorded by specifying the reason for the deletion as part of a manual delete procedure that is logged. Data subjects have the right to receive personal data stored about them in a structured, commonly used and machine-readable format, and to transfer this data to another controller. MailStore Server’s export function in commonly used email formats such as EML, MSG, and PST takes this right to data portability into account. 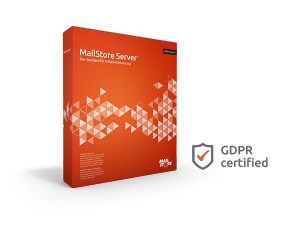 The official certificate on the audit results for MailStore Server can be requested by our interested customers and partners via sales@mailstore.com. 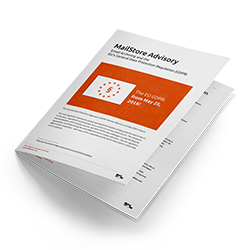 The 4-page Advisory is meant to help you meet legal requirements with the compliance features from MailStore Server.